The newspapers and magazines in this collection are work copies. Kazerne Dossin cannot provide copies of these materials to third parties. Multiple institutes, including: Jewish Museum of Belgium, Brussels; Cegesoma, Brussels; National Museum of the Resistance, Brussels; De Standaard, Brussels; Gazet van Antwerpen, Antwerp; private collections. This collection consists of work copies of original newspapers and magazines stored at other institutes. The Jewish Museum of Deportation and Resistance was inaugurated in 1996 at the site of the former SS-Sammellager Mecheln, better known as the Dossin barracks. In 1994 researchers Maxime Steinberg and Laurence Schram had started working on the permanent exhibition. 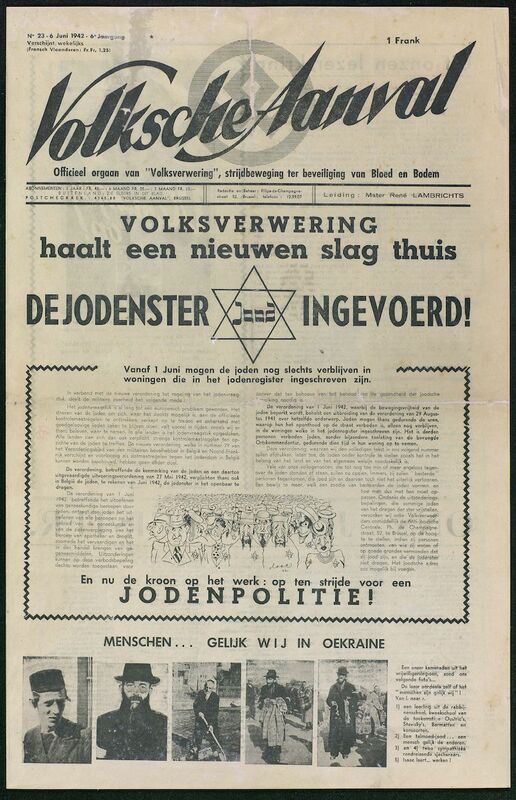 Searching for newspapers and magazines on the Holocaust in general and the Belgian case in particular, they assembled a research collection containing work copies of important newspapers and magazines which were part of the archival collections of other institutes. Thus a research collection was created. Kazerne Dossin as the successor of the JMDR inherited its archival collections, including the collection of miscellaneous newspapers and magazines (work copies).